When Pope Benedict lands in England, he will encounter fallout from his failure to fire bishops who shuffled predator priests who raped and sexually abused youth. The pope should retract the Vatican's recent decision to link pedophiles with women priests, a move that has been condemned worldwide. The Vatican's hostile edict which prescribed automatic excommunication for anyone associating with the ordination of a woman reminds us of the church's long history of misogyny with its insinuation that the ordination of a woman somehow defiles the sacrament. Is it a crime to ordain a woman or is the real crime to continue to discriminate against women in the church? 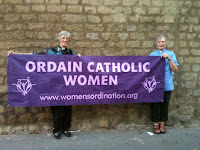 Roman Catholic Womenpriests claim equal rights by using equal rites to bring justice and equality to the church. 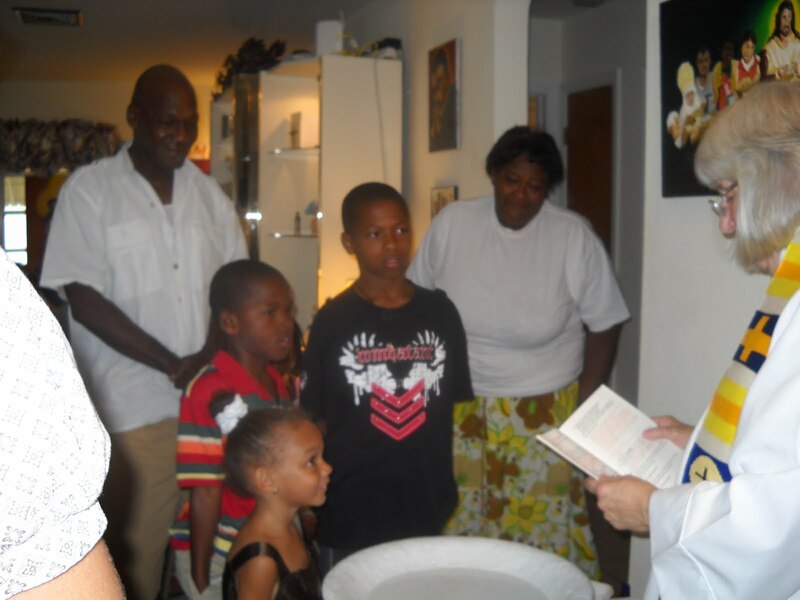 Roman Catholic Womenpriests are leading the Catholic Church into a new era of justice where women, ordained validly in apostolic succession, are offering the church a renewed priestly ministry in a more open, inclusive community of equals where all are welcome to receive sacraments and all are called to receive Eucharist at the Banquet of Christ's boundless love. "A few weeks ago, I was interviewed by NET NY, the cable TV broadcast station for the Diocese of Brooklyn and Queens. From what I understand, some of my comments will be used on a special that they are putting together as background on their coverage of Pope Benedict's visit to the UK next week." Wisconsin Public Radio program, "Here on Earth"
"The world was shocked when the Vatican recently equated the sin of pedophilia with the sin of women's ordination. In spite of the ban, the ordination of Roman Catholic women priests goes on unabated. To talk about the issue, we'll be joined by Maryknoll priest and activist, Roy Bourgeois, who has been excommunicated for his support of women's ordination, and Reverend Alice Iaquinta, Regional Program Coordinator for Roman Catholic Women Priests in the U.S. who offers a structural critique of the Vatican's rhetoric. " Sermon: "Parable of a Prodigal Daughter"
In today’s Gospel, Luke presents to us three “lost and found stories”: A shepherd and his sheep, a woman and her coin and a father, and his two sons. In the first and second story, the objects to be found are passive. Neither the sheep, nor the coin, participate in their being found. That is different in the famous story of the prodigal son. The son makes the initial move to return. He has a change of heart and because of the movement of his heart, he redirects his life journey. It is this active involvement of the one found, which challenged me to focus on the story of the prodigal son today as we celebrate Alice’s Mass of Thanksgiving. But before we speak about the journey of the lost child back home to the parent, let us for a moment think about the audience in front of Jesus when he presents his three parables. Luke tells us that the majority of people, crowding around Jesus, are “tax-gatherers and other bad characters”, but there are also “doctors and Pharisees”, and they are the ones who grumble and judge him, because he hangs out with the sinners. In good Hebrew fashion, Jesus does not give them an intellectual lecture in response and in his defense, but he tells three parables. A parable is, according to the dictionary “a narrative of imagined events to illustrate a moral or spiritual lesson”. Considering the audience and their interactions with each other and with Jesus, it is not difficult to understand, that Jesus’ main theme weaving through all three parables was, that our God is more concerned about those who seem to be lost and find their way home than those who smugly believe, they have already arrived. There is another aspect of these parables upon which I want to touch, before I actually tell you my interpretation of the story. Like much of scripture, we do not only deal with the actual words Jesus used, but we are exposed to several interpretive layers on top of the original story. The early Christian community added these layers to make sense of their own experiences, their joys and tribulations as followers of Jesus. Luke, the evangelist who put all these layers together, is known as the one who gives voice to the poor and powerless. He mentions women more often than any of the other Gospel writers. He is no Feminist, however. In the Women’s Bible commentary, Jane Schaberg, calls the parable of the prodigal son, the parable of the missing mother. This really intrigued me!! It is a problem for us women that the authors of scripture are all men and that women are mostly passive and silent. Even those passages which gave women a voice were silenced and buried systematically in the past two thousand years of our church’s history. Feminist theologians and scripture scholars encourage us to deconstruct and reconstruct women’s voices in our sacred scriptures. There once was a mother, who had a daughter and two sons. The mother had great plans for all of her children. She told her children often that she was preparing them for important work in her large vineyard. But the daughter was timid. She had been told by her relatives, her brothers and by her friends, that she was most lovable, when she was agreeable and servile, pretty to look at, but not too outspoken. One day, the daughter said to her mother: I will leave you and find myself a husband to take care of me, have children and raise them. That is what my calling is all about. The mother was very sad, but she let her daughter go, because she was a wise mother who knew that with a teenage daughter, there is not much room for reasoning. The daughter went out into the world, she found husbands, she had children, she made friends and lost them. Once in a while in the ups and downs of her life, she remembered her mother’s plans for her. But the voice was not clear yet. Then the daughter became quite ill. She felt very lost and lonely. In her loneliness, confusion and fear she became more and more aware of her mother’s call. The voice became stronger. She understood, that it had been necessary for her to leave, that the experiences of her life had made her the mature, intelligent and compassionate woman she now was. Audre Lord’s words came into her mind: “When I dare to be powerful, to use my strength in the service of my vision, then it becomes less and less important, whether I am afraid.” Finally she said: Let me go home to my mother, she loves me and will care for me. She knows my inner being. She is calling me to serve her and in her service I will understand more deeply who I am and how I can be present to those who need me. When the mother saw her daughter coming home she ran out and opened her arms wide to receive her back. She said: Welcome daughter, come and receive your inheritance which I have kept for you. Come put on an alb, a chasuble and a stole. You did not know your worth, but you have turned around and come back. Let’s celebrate! But what about the two brothers? I know, I should stop right here and not turn the parable into an allegory explaining every detail. But it is too tempting to draw some parallels. The older brother came in from the fields and complained: Mother, I have served you for two thousand years. Who is she? A woman cannot represent our brother Jesus. I have done the work for you all the time. No one has the power to give her equal rights. Not even you, mother. The younger brother, however, rejoiced and said to his sister: It’s about time you came home. There is so much work to be done. Welcome home, sis. Let’s celebrate first, but then let’s get to work. The mother was much more pleased with the younger brother. She nudged the older one and encouraged him to join the festivities. But he was not ready, yet. He is still out there, pouting. Then the mother turned to her daughter, she put her arms around her shoulder and led her into the large central room of the house. There were large vases of fragrant roses. Everything needed for a party had been prepared. And the mother said: Let’s celebrate: You, my daughter have come home and you shall preside at the celebration of Thanksgiving, at the Eucharist. Regina preached this homily at Alice Iaquinta's Mass of Thanksgiving. Frederick, MD September 10, 2010 -- PublishAmerica is proud to present Come by Here: Church with the Poor by Judith A.B. Lee from Fort Myers, Florida. This moving book gives voice to the poor and illuminates ministry with people who are facing poverty, homelessness, systemic oppression, and a host of life’s challenges. Interwoven are the poignant stories of the people and the author’s reflections on the Church in the Park and the Church in the House ministry. Asserting that Good News for the poor must include being poor no more, it tells a story of hope in the midst of profound struggle. It begins and ends with the theology of the poor as informed by the Gospels, the people themselves, and relevant theologies. It is church emerging fully alive from the ashes of dying institutional churches that fail to make church with the poor and outcast even while they may provide alms and food for them. You will not put down this inspiring account of ministry, faith, and love. Known as “Pastor Judy” to the members of the Good Shepherd community in Fort Myers, Florida, Rev. Dr. Judith Lee lives her life-long call to love and serve the poor. With Doctorates in Ministry and Social Work, she has been serving the homeless since 1982. The author of many publications, she is Professor Emerita at the University of Connecticut. She was ordained a Roman Catholic Priest in July of 2008 and is a leader in the Southern Region of Roman Catholic Women Priests. go to bookstore. Type in Come By Here: Church with the Poor. Also book will be available on amazon.com in Nov. I am sure you have all heard sermons on the Parable of the Prodigal Son many times, but have you ever thought about the Parable of the Prodigal Daughter? A man had a son and a daughter. The son worked with his father on the family farm. Certainly he worked very hard, but he shared in the making of decisions about the running of the farm, its buildings, and the people, who lived and worked there. He also shared in the teaching of the farm workers and household servants. The daughter also worked very hard on her father’s farm. She cleaned, cooked and served meals, made clothes and did the mending, cared for the old, and the ill, and sometimes also worked in the fields. But she had no say in any of the decisions that were made! Indeed she was rarely consulted about anything! Her father and brother, and sometimes her mother too, simply took her for granted. She rarely complained, or protested, but if they ever did pay any attention to her, it was only to denigrate her and make the situation worse. One day she decided, she had had enough! She asked her father for her share of the inheritance. Her father was extremely annoyed and anxious about her request, but she insisted, so he gave his daughter her share of his property. The daughter promptly packed her possessions and left home. She travelled to a great city and spent her money studying with the best scholars and Rabbis. She worked very hard and became a respected, knowledgeable scholar. Eventually she was consecrated as a priest in a synagogue of the Diaspora and people came to hear her preach and teach. Meanwhile, there were more problems on the family farm. Her mother had died, her brother’s wife had divorced him for domestic abuse and finally the housemaids had left to work for the farmer across the road, who was much more ethical and considerate in his attitudes. He paid them decent wages and treated them much better. The farmhouse was now in a state of crisis! The kitchen was in chaos and there was no food in the pantry. What was worse, everyone far and wide was talking about them! And needless to say, news of the daughter’s academic and professional success had reached the farm. Eventually, the father and brother came to realise that they would simply have to change their attitudes and take drastic action. So the father packed the saddlebags of a donkey with what he needed for the journey and travelled to the town where his daughter lived. On the way he contemplated about what he would say to her, and decided that he would say, “Daughter, I have sinned against heaven and before you. I am no longer worthy to be called your father: treat me like one of your students.” However, the daughter saw him in the distance and ran to greet him. The father made his confession and she flung her arms around him and kissed him. The daughter forgave him and agreed to return home with him. After they arrived at the farmhouse, all the farm workers and neighbours gathered in its great kitchen and prepared a feast to celebrate the daughter’s home coming. Her father presented her with a set of the best priestly vestments and sat her beside him at the head of the table, where she presided over the Passover feast and the local people asked her to be the priest at their synagogue, which had not had a rabbi or a priest for several years. So they spent the evening feasting and rejoicing, because the daughter, who had been oppressed and rejected, had been brought home and given dignity and equality. 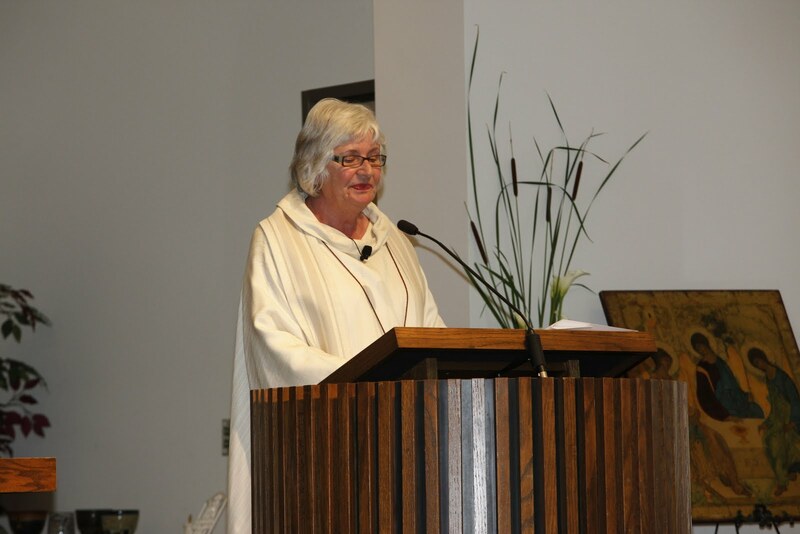 "Sandall became the second Santa Barbara woman to be ordained through RCWP and will be joined by a third on September 12 with the ordination of a former nun, Jeannette Love. Love has been part of a Renewal Team that was trained — as decreed by Vatican II — to work within the community to help sisters transition to a more open community life. Love and her team had asked for liberties reportedly granted to them in Vatican II, but their requests were denied by the Superior General from Rome and Provincial Council. They were told to abide or leave." Pope Benedict concluded his comments on St. Hildegard in the following prayer: "Her vast learning and spiritual authority also led her to work for the renewal of the Church in her day. Through Saint Hildegard’s intercession, let us ask the Spirit to raise up wise, holy and courageous women whose God-given gifts will enrich the life of the Church in our own time!" St. Hildegard, courageous prophet, who condemned hierarchical corruption, and who triumphed over harsh punishments including interdict, walk with us as we practice prophetic obedience to the Spirit by following Jesus' example of Gospel equality and reclaiming our early church heritage of women in Holy Orders. St. Hildegard, advocate of justice and equality, walk with us as we work with the people of God to renew priestly ministry in a more accountable, just church where-- all are treated as beloved sisters and brothers, and where all are welcome to celebrate sacraments in inclusive communities. St. Hildegard, truth-teller and reformer, may we, like you, speak truth to power to the hierarchy and to Pope Benedict about the abuse of spiritual power, clericalism, gender apartheid, patriarchy, and all the isms that corrupt our modern day church. St. Hildegard, woman of mystical prayer, whose prayer embraced feminine imagery of God, may we, like you, affirm the feminine face of God as we use our spiritual gifts to reform the Church of our time. In St. Hildegard's time, there were calls for radical reform of the church to fight the problem of abuses made by the clergy, the pope said. However, she "bitterly reproached demands to subvert the very nature of the church" and reminded people that "a true renewal of the ecclesial community is not achieved so much with a change in the structures as much as with a sincere spirit of penitence" and conversion, the pope said. ...Her work shows how "even theology can receive the distinctive contribution of women, because they are able to speak of God and the mystery of faith with their distinctive intelligence and insight," he said. The pope encouraged female theologians to continue their special contribution to the church in a spirit of fidelity and by enriching their reflections with prayer." RCWP’s mission to challenge the church with regard to the ordination of women is ongoing and we continue to use the Roman Catholic Rite of Ordination. 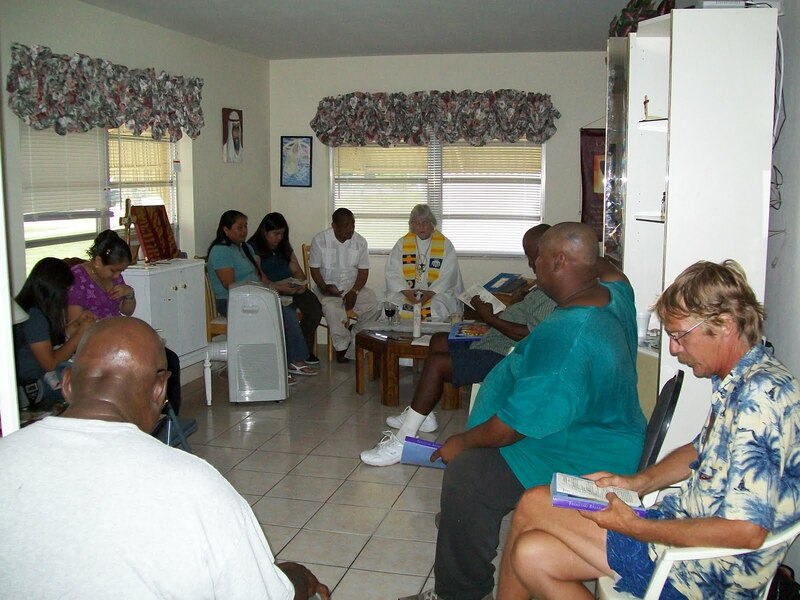 We are, however, mindful and respectful of the right of all people to respond to their call of prophetic obedience through discernment within their communities. 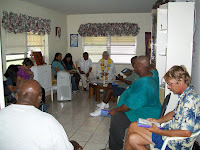 Community calling and ordaining of a member to serve as its priest is a tradition from the very first three hundred years of Christianity, before Christianity became legitimate and accepted by Roman society. Thus, it is a venerable tradition that we honor, along with the later tradition that evolved over centuries, that of Apostolic Succession as part of ordination validity, which is what we follow. We pray that God will abundantly bless the members of Mary of Magdala Apostle Catholic Community and we embrace, with great joy, our abiding relationship with them. ... If they were doing so, they would hear the pain of the victims of clerical sexual abuse without obfuscating the issue by linking it with the topic of women’s ordination. ....For those of us who love our church, it hurts to see the already eroded credibility of church leaders become even more eroded by this apparent glossing over of the heinous crime of sexual abuse of children. ..
May I point out respectfully that the treatment recommended by Jesus for those who scandalize little ones was fastening a great millstone around their neck and having them drowned in the depth of the sea (Mt. 18:6; Mk 9:42; Lk. 17:2), while in selecting proclaimers of the all-important good news of the resurrection, Jesus chose women. "